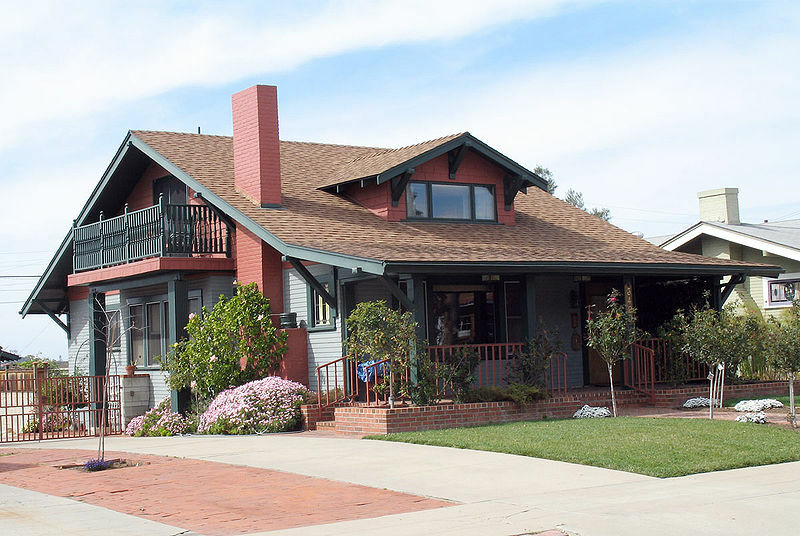 Southern California, land of the sun, beaches and, in the early 20th century, the Craftsman cottage. The Craftsman style was a take on the English Arts and Crafts movement, adapted by Charles Sumner Greene and Henry Mather Greene. Also referred to as a Craftsman bungalow, they added design elements of oriental wooden architecture to create a unique style. Over time bits and pieces of other architectural schools were added, but the main features are consistent across all examples. These are some of the basic architectural features you find in Craftsman style houses. The porch is the instantly identifiable feature when you see a craftsman cottage style house. They came in full or partial width and were covered by the main roof or had their own roof that extended from the main house's symmetrical facade. The columns that supported the porch roof are normally tapered and set on stone or brick piers. Additional design elements seen on the exterior are exposed rafters, false beams under gables for decorative purposes, wood siding and pronounced dormers. You know a craftsman style house by the distinctive elements that comprise the roof design. A broad gabled roof with a low pitch, exposed rafter tails and a dormer distinguishes this style. The decorative embellishments of the main exterior are extended to the eaves created by the overhanging roof. The roof over the front dormers is accentuated, standing as an almost cross gable to the main roof. The principal entrance was windows on either side of the door and both the door and windows are wide. The doors you see a craftsman style house are partially panned. The door's upper third has glass panes outlined by trim, and they open directly into the house's living room. The windows typically are grouped together and multi-pane sash or casement style with a window box. The open floor plan and use of natural materials are two of the hallmarks of this style of architecture. The attention to detail in the casing, baseboard and other molding reinforces this aesthetic. Natural light is another feature often found in the Craftsman, provide by the numerous large windows. You find several distinct variation like the aeroplane (pictured above), eclectic and colonial craftsman. The aeroplane has a second story that is set back with an extended overhanging roof that resembles an airplane's wings. The eclectic influenced version incorporates styles prevalent in the area it was constructed and can include elements of Swiss and Tudor style architecture. A colonial craftsman focuses on an outer symmetry and employs trellises on its porch. The style itself is incorporated into other architectural styles including the foursquare, mission and pueblo. The craftsman style was a reaction to the industrial revolution, hearkening back to the individuality and craftsmanship of the 19th century. Much of the inspiration is found in the English Arts and Crafts movement that was growing in popularity during this time. A Craftsman cottage is a beautiful melding of form and functionality that is seen in the attention to detail and a compact design.